ADJUSTABLE Perfect for medical and dental offices, this rolling stool features a 360-degree All-Around pneumatic stool height adjustment lever that allows you to quickly adjust the pneumatic stool height from anywhere you reach under the seat. CUSTOMIZE 36 different color and caster combinations! Choose your casters according to the type of floor you have: Soft Floor Casters for carpet and linoleum; Hard Floor Casters are best for wood, tile, or ceramic floors; or if you don't want it to roll choose Glides - they'll keep your chair stationary. BUILT TO LAST Designed to be used all day - every day! 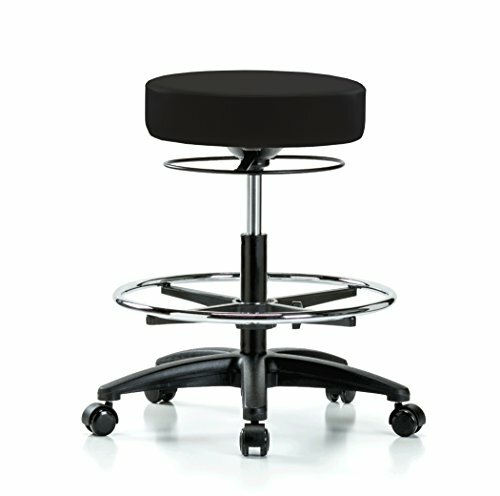 The seat on this work stool is 17" in diameter and has a 3" inch layer of foam padding. It's durable 5 leg 24" diameter fiberglass reinforced nylon base will hold up to 300 lbs. of weight on a daily basis. If you have any questions about this product by Perch, contact us by completing and submitting the form below. If you are looking for a specif part number, please include it with your message.